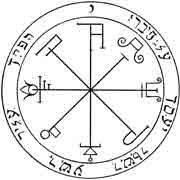 This pentacle helps to deliver and to put shielded from possessions and obsessions which are the fact of the lower entities of bottom astra. It protects against the depressing psychic currents which cross the astral atmosphere. It helps to stimulate the intellectual faculties by making them permeable to the powers of inspiration where draws the genius of the human being.